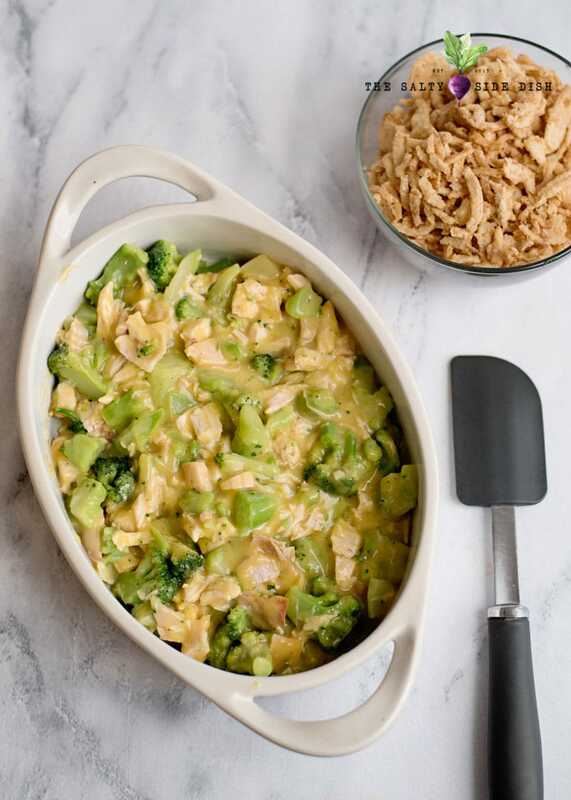 Chicken broccoli cheese casserole, an under 30 minute easy baked dish, is about as simple as it gets for a weeknight dinner. 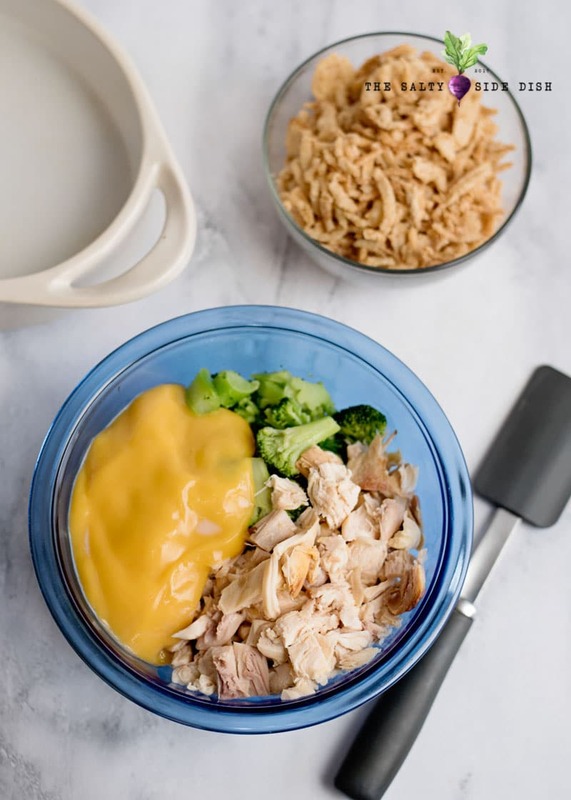 Slightly deviated from my original broccoli cheese casserole, this one involves cheese soup and delicious bites of chicken. I love dump casseroles. They require so little preparation and in under 30 minutes can have a perfect hearty and easy dish that the whole family loves. 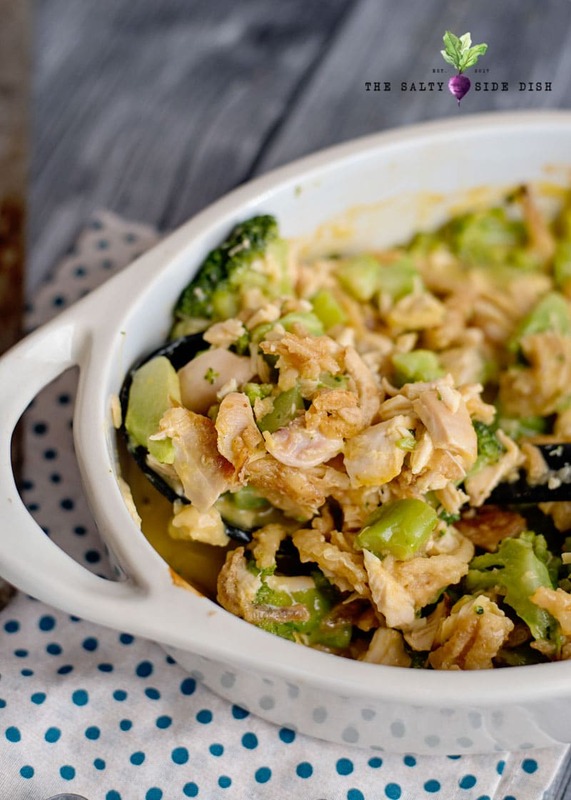 This side dish makes a great main dish with the additive of chicken. Personally I use cut up rotisserie chicken, which you can grab in almost any deli in any store. This takes the preparation work out of the dish but still makes it homemade with a little tweaking. It also makes rue the chicken is extra soft instead of over baked after the casserole heats up again. Preheat oven to 350 degrees and prepare a 2-quart casserole with non-stick spray to make sure your casserole doesn’t get stuck. 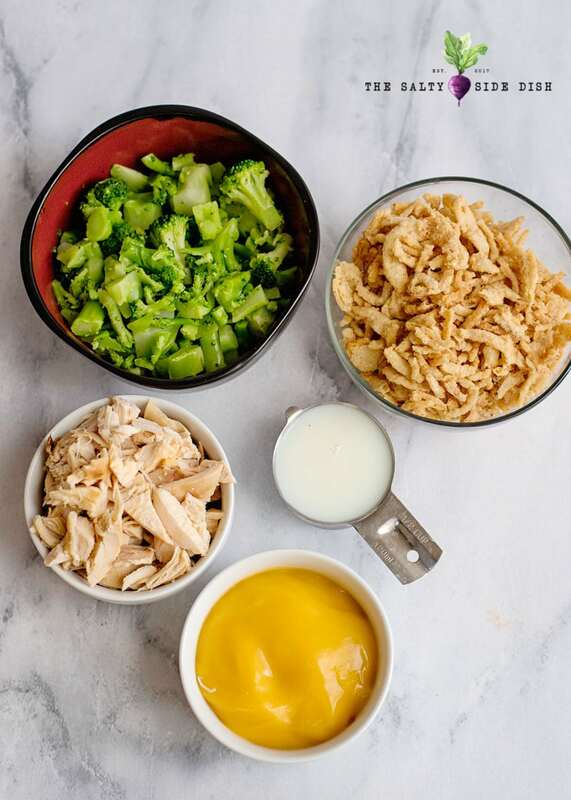 In a medium bowl, mix together the cheese soup, milk, broccoli and chicken. 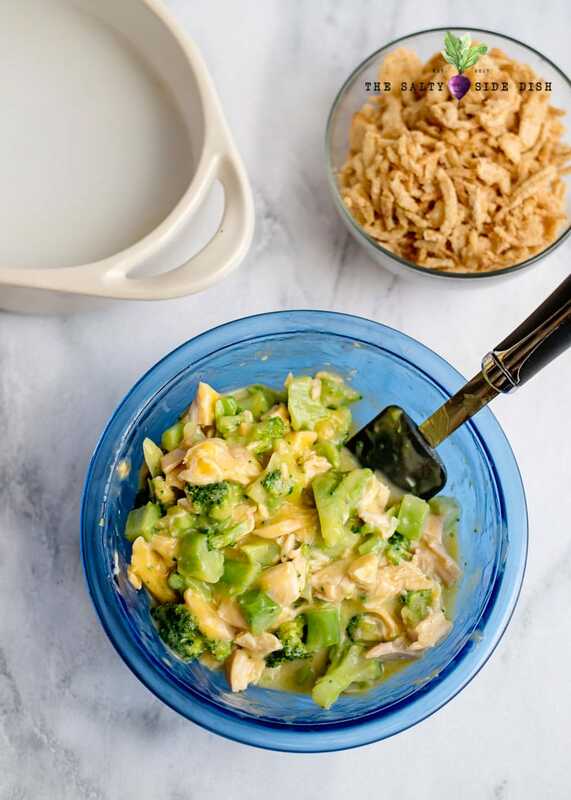 Pour your chicken broccoli cheese mixture into the 2-quart dish and bake for 25 minutes. 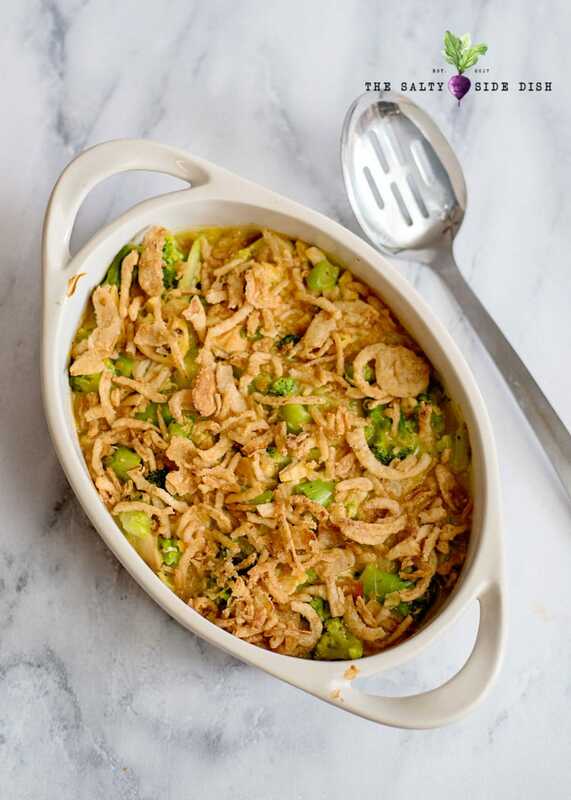 Top the chicken and broccoli casserole with french fried onions and bake for another 5 minutes to make sure you get a delicious crunch on the topping. Can I use other kinds of Chicken in this Bake? Sure! If you do not mind prepping, you can bake, pan fry, slow cook, or even boil up some chicken. Personally I like chicken that can be pulled apart which make for a better casserole, so I recommend if you do not buy rotisserie chicken, to boil or slow cook. 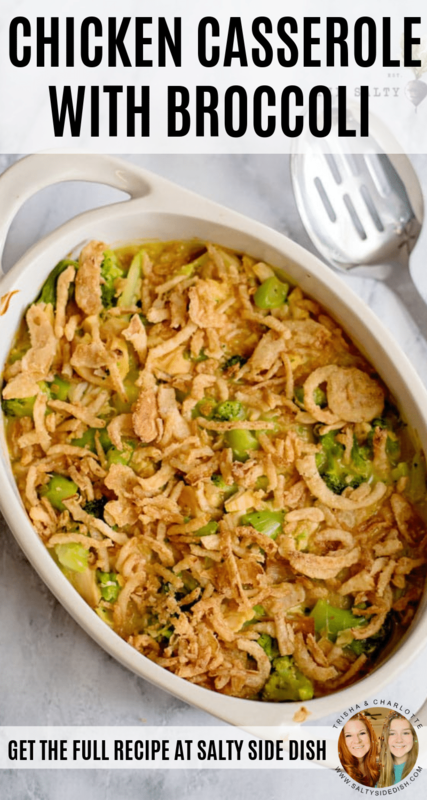 Can I use frozen Broccoli in this casserole? You sure can! Just make sure you cook it prior so its already soft. 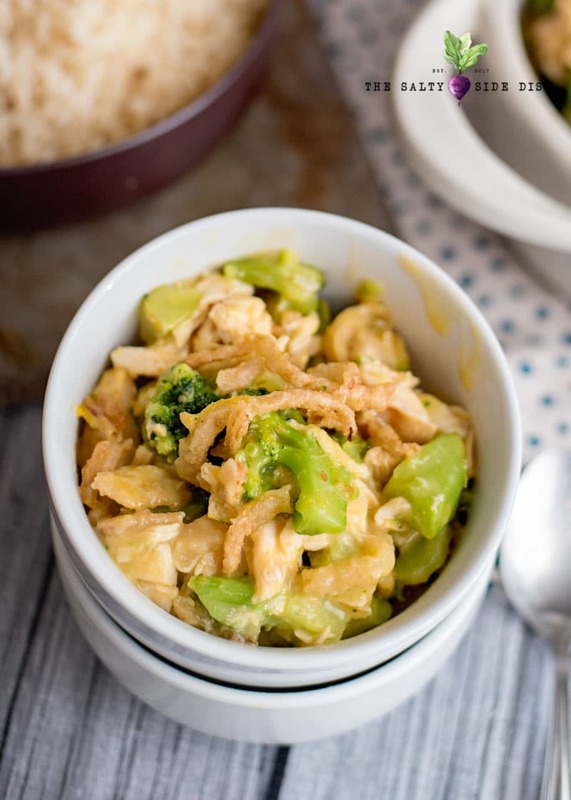 If you add it directly frozen to the meal, the casserole runs the risk of being a little watery since frozen veggies tend to hold some moisture. Preheat oven to 350 degrees and prepare a 2-quart casserole with non-stick spray.